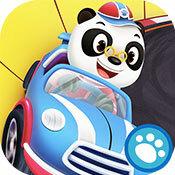 Be sure to add Dr. Panda Racers to the list of summer fun for your kids! As always with Dr. Panda, the graphics are fantastic and the characters are enticing. The racing action is sure to be a hit with our little car and truck lovers 🙂 There’s lots of action to enjoy on the track with all the fans cheering. Try some flips and stunts to get through the race! Kids can choose their favorite race characters and everything they will need for the race. Build a new car or truck and paint it while it’s in the shop. You can wash it, and then fill the tank and tires to prepare for the race. Hang on for a wild ride! You will need to swipe and control the gas peddle to win the race. When you win there is an awards ceremony complete with confetti. The winners get a new car part to use when creating a new car. Remember to tap the road map and create new racetracks. Parents: The app, upon opening, allows you to easily swipe to turn off any promotions. Just click ‘Parents’ and swipe. Fill Your Tires & Wash Your RaceCar! Pick Your Driver & Build A Car! Win The Race & Collect Your Prize! 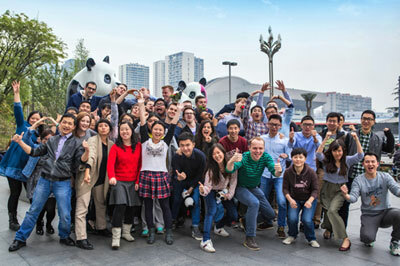 One time I was walking in a big shopping mall in Chengdu, China (where the Dr. Panda studio is located!) and saw a huge electric racing track for toy cars right in the middle of the mall. It was free for any kid to play with, and was really nicely decorated with houses, flags, and all sorts of other stuff. Kids were crowding around, cheering and racing their cars around the track. Watching them play reminded me of how I used the have a track like that when I was small. I remembered how much fun it was to build your own race track out of different pieces, then race on it. Of course, moving the car around as fast as you could was the most fun! That’s what inspired me to develop the concept behind Dr. Panda Racers. I like that we’ve designed the game so that there’s something for everyone! Some kids will just start racing, while other players start by spending a lot of time making their cars, choosing parts carefully and painting it to perfection. Don’t hold the gas pedal while turning corners! Also, keep an eye out for future updates! We intend to add extra content like new animals to race, and new car parts to customize your cars even further!